The new hydraulic hose assemblies should be chosen with consideration to their specific application. If you’re creating a new hose from scratch, you need to, say, lay it all out to decide what kind of hose you need. You may have seen this trusty acronym, STAMPED. Every letter stands for something. We have Size, Temperature, Application, Material, the Pressure, the Ends, and then Delivery, delivery being how much you need and when. We will go through this acronym, the STAMPED, and discuss every stage of hose selection up towards assembly. First consideration is size. The size includes the ID, the OD, and the length. ID of hose is critical because the hose must be sized appropriately to handle the flow with little pressure drop. If you have a system with 12 gallons a minute of flow, something around a half inch hose is probably pretty good. If you’re a 30, 40 gallons a minute, half inch is no longer acceptable. There’s too much pressure drop. I’ve seen applications of 500 feet of hose on an underwater robot that was run by hydraulics, and it had one and a half gallons a minute of flow, and even using quarter inch hose caused 1,500 psi pressure drop. That shows how critical hose diameter can be. Measuring the length, a lot of people will take an old hose assembly they pull off a machine or just a new assembly that they’ve had somewhere and they’re trying to copy it and they’ll measure the entire tip-to-tip length. That’s not really the right way to do it. If you try to copy that, you’ll end up a hose length that may not fit to the machine that they came off of. Using this example, the overall hose assembly length is actually where the fittings join. One thing to factor when you’re going to size up your hose, it’s good to get the whole end-to-end length of the hose, and just the example that we have, but that’s not where you want to cut your hose to. If you cut your hose to that entire measured length, then your hose is going to be too long. I’d rather have a hose that is too long than too short, but it can cause bunching and vibration and it just might not fit and look pleasant in the end. One thing you have to factor is how far the hose goes into the fittings. What we have here on hose is what we call the cut off factor. Each end of the fittings has a factor for how far the hose is pushed into the fitting itself. You have to subtract that from the total hose length. Moving on to temperature, this is critical for applications, which type of hose you choose. What is the temperature of the fluid, which is important, and then also what is the ambient temperature, which is often more important? A typical hydraulic hose is good for -40 Fahrenheit up to 212 Fahrenheit. Now, why this is important consideration for ambient temperatures, because no hydraulic oil likes to get up to 2012. At that point, you’re cooking it. You’re boiling and it dissolves water that’s saturated within the fluid. You’re oxidizing it very quickly. The fluid is varnished very quickly. It’s just a terrible condition to have, hydraulic fluid that is that hot. However, you need to be able to ambient temperature in machinery, mobile machinery specifically where you could have hoses running right past an engine or near exhaust components underneath the chassis of a truck. Examples, in steel mill as well, so you might have high temperature hose that is good for >300° F, actually specified, that’s also ambient temperatures, even if you have high water-based fluids that are fire-resistant, you still have to have hose that is going to resist melting or fracturing or softening and having the whole hose ends to come apart. I should mention that when it comes to handling those kinds of temperatures, a high temperature hose up to 300° is for ambient temperatures not for the fluid itself. Conversely, you can have low temperature hose. This could be good to -58° F or lower and specific for cold ambient conditions. Here we have an excavator running in some arctic temperatures. The machines are so reliable these days, they can run all year round. I mean, we used to have construction season from May to September, and now, construction season lasts all year long. 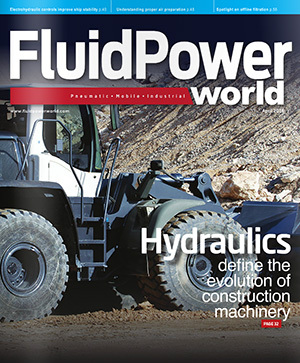 It’s because of the nature of hydraulic machinery and how much more reliable they are. What happens is when you have a cold hose, it becomes more brittle, so it’ll crack and fracture, but it could also just have a poor bend radius or just poor reliability, so a cold temperature hose can be appropriate. Then discussing further, we have your application. This is specific to what this is regardless of all the other factors. Where is the hose being used, and then what is the required bend radius? These are application details. When discussing a bend radius, here we have a picture … Oh, I’m actually showing bend diameter, but bend radius would be half that dimension. This is an example where you have two components that need to be closely mounted to each other. The ideal situation is it would be a hard plumb with tubing, but there are some cases where you have to use hose for vibration resistance or perhaps two components, they move away from each other. They could be on a boom, or they could be on a cable track or something, like an injection molding machine platen. High bend radius hose can be used, which if often twice the flexibility of standard hydraulic hoses. More details about the application: what are the external conditions? Not just with the cold weather, but is there a risk of abrasion or corrosion or electrical conductivity? Abrasion-resistant hoses exist. The outer cover is reinforced so that it can rub against things without wearing away. It has a tougher cover. You may have corrosion-resistant braiding. For example, a lot of hose will have braided or spiral steel. You may have a synthetic fiber such as Kevlar as that braid, which obviously will not rust, because any water that gets on to a hose, the cover is permeable, water can’t seep through. If you go back to that image I saw earlier with the Ute hose, that braiding can rust, and as it rust, it loses strength. You can have hose breaks and bursts. Having corrosion-resistant braiding material could be important. If you work around power lines like you see in this picture here, you want to have electrical connectivity avoided at all cost. You can imagine a hydraulic hose will touch one of these power lines, and then conduct electricity right to the machine and to the ground or to the operators. They use a non-conductive hose that would be of a synthetic material that can still handle pressure without actually conducting electricity. The next step is selecting your material. What type of fluid is being used? This is critical to hose selection. A standard mineral-based hydraulic fluid is compatible with most hose types. Most hose types might have Nitrile Buna tube on the inside, so that would be inner portion of the hose. Most standard hydraulic oil, the AW-68 or what have you, the industrial oils, and most of the machine oils that we use, transmission oils, ATF, that stuff is usually good with most of your standard hydraulic hose constructions. You could have some exotic fluids like phosphate ester which requires synthetic hoses made of EPDM. It’s a little bit more of a nastier, corrosive fluid that requires a more … Well, I wouldn’t say stronger, but something that is better for compatibility, something that will not break down or crack or become brittle because of the nature of the fluid. There are cases too where you have high water-base fluids that may affect your selection of hydraulic hose as well. High water-based fluids might have an emulsion or some that are glycol or something like that, but still, the content of water can make them react with the steel braiding, and then have it rust over time as well. Then pressure, of course, pressure is what hydraulics is all about. Pressure capacity is the defining criteria for hydraulic hose. It’s why it exists, and it is why hydraulics is the magical principle that it is. The pressure capacity that you need dictates hose construction. There are a lot of ways to skin a cat, and there’s also a lot of ways to make hydraulic hose. The pressure that you need combined with all the other factors we discussed so far will affect the construction of that hose. Hose construction dictates the pressure capacity of the hose. How it’s constructed will depend on how you can rate your hose for pressure.